HomeConspiracyAs Flu Deaths Soar, Big Pharma Pushes Their Answer: ‘Death By Lethal Injection’ – Has The 2018 Flu Been Genetically Manipulated? As Flu Deaths Soar, Big Pharma Pushes Their Answer: ‘Death By Lethal Injection’ – Has The 2018 Flu Been Genetically Manipulated? In this January 8th story over at the Santa Barbara Independent they report the flu had just killed 8 people in Santa Barbara, what the ‘public health czar‘ for Santa Barbara County was calling “unprecedented numbers“. Also warning that the number of patients testing positive for flu at local hospitals there was “off the charts“, Steve Quayle had left an interesting SQnote while linking to that story: “Whenever you see the word unprecedented its a heads up to consider intentional, manipulated virus – note the ages”. As the SBI story noted, each of those who passed away was over the age of 65 yet, despite the announced fact that this years flu shot has largely been ineffective, as this new SQAlert also noted, doctors are still suggesting that the young and the elderly take their flu shots, despite even heavy medical industry doubts over its effectiveness. Why would doctors recommend that their patients get the flu shot this year despite its ineffectiveness, with 7 of the 8 flu death victims in Santa Barbara having gotten the flu vaccine themselves? The full SQAlert is republished below. With the state of California’s flu epidemic running 300% above the 5-year average according to this story from Breitbart and not just packing emergency rooms to beyond capacity but bringing widespread medical shortages, even some ANP readers have mentioned in the comment section that they or friends or family members had fallen ill to the flu or some other mysterious illnesses recently. In this story we’ll take a look at the deadly flu striking America as well some alternative health remedies that some people are using to help themselves and their loved ones fight this winter onset of illness. We’ll also take a look at some signs that this outbreak of the flu may have been genetically modified though at the moment we’re not in the position to prove so. 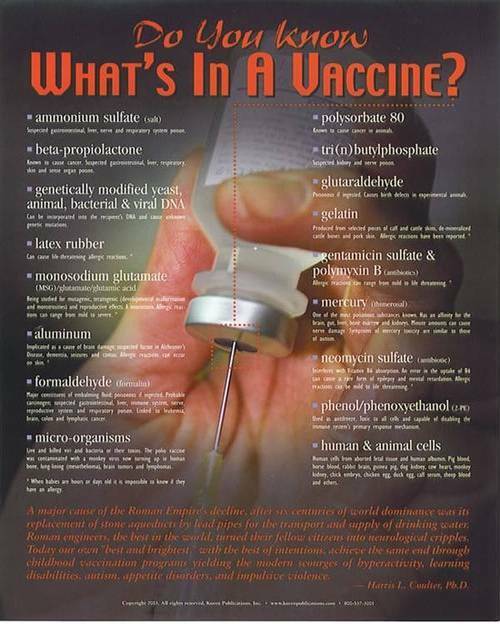 As we hear in the 2nd video below featuring Jon Rappoport along with Infowars as is also shared in this Rappoport story, big pharma and the vaccine industry pumped $3.2 billion dollars into TV ads for drugs during the 11 months preceding his story. As he mentions, that kind of money not only buys them influence, but it buys them control. 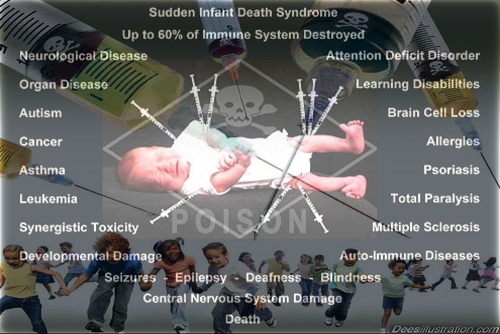 According to this 2017 story over at the website Health Impact News titled “Government Vaccine Injury Report Continues to Prove Flu Vaccines are Destroying Lives”, the federal government’s Advisory Commission on Childhood Vaccines (ACCV) had determined that at least 275 people had been injured with at least 4 deaths from the flu shot in 2017. Yet with this massive outbreak of flu cases across the US, as our videographer tells us in the 1st video below, we might want to avoid the massive propaganda push to get the flu shot now, especially with it being largely ineffective. 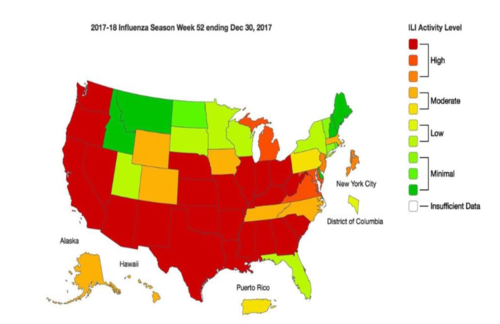 As we see in the map above taken from this Weather Channel story, with widespread flu having now struck 46 states across America, the ‘vaccine propaganda machine’ has been kicked into overdrive. Not only striking the US but the UK as well, where deaths have soared 77% within one week according to this new story from the Daily Mail, might this version of the flu have been GMO’d? With it now exactly 100 years since the Spanish flu of 1918 killed more than 100 million people after infecting nearly 500 million people in Europe and throughout the world as reported in this new story over at the Daily Wobble, it’s long been warned that globalists intent upon depopulating the planet might manipulate such a deadly disease to do so. Could the Spanish influenza strain of 1918 — the unholy grail of infectious diseases — be resurrected as the ultimate bioweapon? “It would not be easy; but with advances in this technology, it gets easier every day,” warns Mohammed Madjid, MD, lead author of a provocative new paper about the possibilities of using the flu virus as a weapon of bioterrorism. According to this December 29th story over at Natural Blaze, FDA-approved medical drugs kill 106,000 Americans per year. As their story points out, that’s a MILLION deaths per decade! 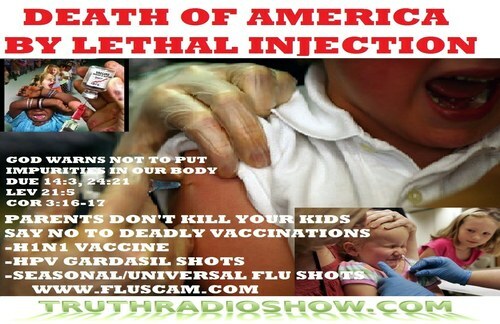 Death by lethal injection? And as was previously mentioned above, why would medical doctors still be insisting that their elderly and very young patients get the flu shot when they know that it is ineffective? Great points brought up by David S. in the SQAlert below. Steve, what kind of protection is she talking about, the kind that killed seven out of eight who got the shot? I was no math major but if I lived in SB I would take my chances not getting the shot in Santa Barbara. I rarely see a story that so blatantly smells of a cover up like this one. Even in an age of daily coverups!! This lady should be fired immediately for being an idiot, but then again she’s in CA and works for the government…enough said. 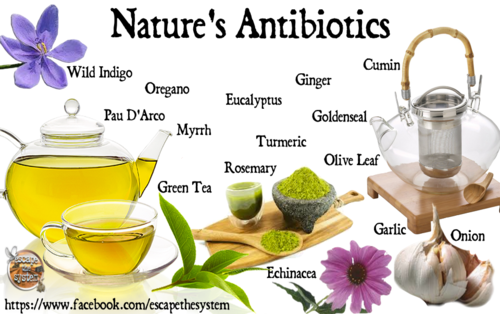 In the final video below, our videographer shares with us numerous natural remedies which she uses to help her own family get through cold and flu season including essential oils, elderberry, garlic, honey and many other natural treatments for the whole family. If you’ve got a personal favorite remedy to treat the flu, please let us know in the comment section below.